The voltage controlled filter! As I mentioned before, this uses a different topology than the Steiner Synthacon filter. I'm no expert in filters (trying to learn! ), but apparently it has some unique elements. Also, it will operate in low-pass, band-pass, or high-pass modes (there's a switch on the front panel). Note the 0.1% tolerance input summing resistors. I've also used a 200k trimpot instead of 250k, as on the VCA. 1.2u electrolytic caps are unavailable, so I've used tantalum ones here instead: a little pricier, but not a big deal for just three of them. 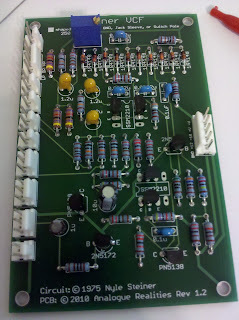 And, as before, I've used the discrete transistor pairs: a totally discrete VCF!